Building a loft conversion is an easy and relatively quick way to add useful living space to your home, as well as adding considerable value to your property. There are many useful purposes of a loft conversion. The most popular is a master bedroom with an en suite bathroom, which is logical given it's placement at the top of the house. A loft conversion can also provide a spacious and self-contained children’s play area, keeping noise levels within its confines. Many people have also made their lofts into a quiet home office or even an action packed games room. On 1st October 2008 new rules covering whether or not you can create additional habitable space in the loft without having to apply for planning permission came into force. The new limits and conditions for what is allowed without the need for planning permission apply largely to the dimensions of the proposed addition, its position on the house, and its proximity to your boundaries. Not exceed the volume allowance of 40 cubic meters of additional space for terraced houses, or 50 cubic meters for detached and semi-detached houses. Any previous roof space additions must be included within this volume allowance. Although you may not have created additional space a previous owner may have done so. Not have any dormers or extensions on the roof plane of the principal (front) elevation facing the road. Roof extensions to be set back at least 20cm from the eaves, as measured along the roof plane (excluding hip to gable). It is very possible that your plans for a loft conversion will not meet all the restrictions to be considered permitted development. You may want to have more space in your loft than the volume allowance permits, or perhaps you are thinking of creating a front facing dormer or extension. You could also be considering the addition of a balcony or veranda to complement your loft. Whichever way your plans may differ from the restrictions, even the use of alternative materials, you will definitely need planning permission before going ahead. The planning regime for flats and maisonettes differs in many important ways to that which covers houses. If you are only carrying out internal works, planning permission is most likely not required. However, local interpretation can vary so it is important to have this verified. If you are planning on altering the roof space with an extension or dormer, planning permission would be required prior to beginning any works. If you have lived in a conservation area for some time you are likely to be aware of the regulations and how these can affect home improvements, however, if you have recently moved into the area it is likely to be new to you. That being said, one of the reasons that you purchased your new home may well have been the character of the area and the preservation the conservation status has provided. It is important to note that conservation areas are not intended to lock an area in the past as a form of living museum, and new development is often permitted, but it will have to be undertaken sympathetically to conform to the existing environment. In a conservation area you will require planning permission for all dormers and roof extensions. It is absolutely necessary to obtain the required conservation area consent prior to beginning any works. Going ahead without this may result in a fine or imprisonment, or both. 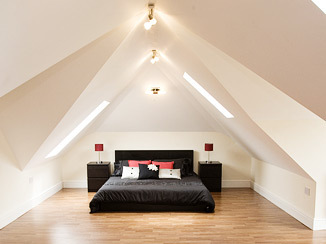 Call Drawing and Planning Today on 0208 202 3665 to find out how we can help you with your loft conversion. At Drawing and Planning, our consultants have extensive knowledge and expertise in the numerous and varying planning articles, directions and restrictions that relate to loft conversions. Our team of consultants would be glad to assist you with any query you may have regarding your loft conversions. Should you need loft conversion planning permission, we would be glad to assist you with all elements of your application. If you would require drawing only, our in-house architects can provide you with detailed existing and proposed drawings for all types of loft conversions. 'Do I need planning permission for a loft conversion?' is a common question that is asked by individuals who may want to convert the existing loft of their home to habitable for use as a bedroom, playroom or office. Normally when converting a loft you will not need to obtain planning permission as most loft conversions will be within a home owner's permitted development rights for loft conversions. As long as you will not be extending or altering the integrity of your roof so that it exceeds the limits and conditions it presently has, you will not have to worry about meeting with loft conversion planning permission consultants. Loft conversions are permitted home developments that do not require full planning permission for loft conversions. However, there are some conditions and limits that you must abide by in order to not need the assistance of loft conversion planning permission consultants. First, the conversion will only be able to receive an allowable volume of forty cubic metres; fifty cubic metres will be allowed to add additional space on the roof for the conversion as well. Your extension cannot exceed the height of the roof of the existing structure. All materials that are used for the conversion must match the appearance of the materials that currently are attached to the home. 'Do I need planning permission for a loft conversion? '; no you do not, as long as you stay within the building limits.